A rototiller, also called a cultivator, rotary hoe, or power tiller is a motorized plow used to till the soil in preparation for seeding. It can also be used to dig out weeds while crops are growing and to turn compost. Although more powerful cultivators are available, such as chisel plows that dig deep into the earth, a rototiller is lightweight and focuses on topsoil tillage. Why Do You Need a Rototiller? Tilling the soil to prepare for planting is the single most back breaking task for gardens and landscapes. Hence, rototillers are an efficient substitute for the garden hoe and spade. There was a time when Cultivators were used only for farms. However, due to the compact design of the rototiller, motorized cultivation is now also available for gardeners. Let’s take a look at the many benefits of a rototiller. Rototillers essentially half the physical labor needed to till the land, so even those who are not strong enough to raise a hoe will be able to do the needed work. Therefore the elderly or other garden owners who physically cannot cope with maintaining a good sized garden benefit greatly. Rototillers do best in vegetable gardens. They’re a big help cutting down yearly garden chores as they prepare the soil for new crops at the beginning of a season. Meanwhile you can clean out the old plants with a swift rototiller. For those who don’t have the time, but still want a decent garden, a rototiller will be ideal for you. This machine isn’t just useful at the beginning of planting season as it can also turn compost and take out weeds. Ultimately, rototillers save time doing regular garden maintenance tasks all year. For owners of large gardens with many walkways that need maintenance, a rototiller can quickly clean out sidewalks, take out weeds from the road sides, around houses and likely wherever else it’s needed. Even if you only own a small property, renting or buying a rototiller for the initial cultivation of dense soil will save you a ton of manual labor. What’s more, rocky ground is practically useless for planting unless dug into and loosened. Hence, those who need to break into very rocky soil find a powerful rototiller very useful. Those are just a number of the many advantages to a rototiller. You can read more on rototillers and their many benefits in our Top 3 Best Mantis Tiller Reviews. There are different kinds of rototillers and choosing the right one for your garden can save you a lot of money. To test if a rototiller is good for your garden without investing yet, consider renting or borrowing a rototiller first. Some hardware and agriculture stores offer customers free demos at their stores so take the opportunity to handle a rototiller yourself before buying. Consider some of these tips below as you make your choice. Additionally, for the best rototillers, check our Best Rototiller article or our Top Mantis Tillers reviews as well. A small garden, less than a few square meters, does well with a mini-tiller. On the other hand, larger gardens around 500 square meters or more, do better with more powerful rototiller with at least five horsepower. Some rototillers run on electricity while others run on gas. Firstly, electric rototillers are smaller and need to connect to an outlet with a long electrical cord. Electric rototillers only go as far as the power cable will allow but they are also lightweight and easy to store. Meanwhile, Gas-fueled rototillers are more mobile as they are not limited by an electric cord. Also, these machines are more powerful and heavy-duty. Heavy-duty rototillers are best for rocky and hard soil, even with small gardens. This is because it takes more power to till the dense rocky soil.
. There are two types of rototillers depending on the location of the blades. The first type are Rear Tine tillers. This type is characterized by Blades at the rear of the rototillers with its big and heavy wheels in the front. Rear Tine tillers are easier to drive and direct. Additionally, they work well with hard soil. The second type, with blades at the front and rear wheels, are called Front Tine tillers. This tiller needs more manual effort to pull or push along the ground. More so as you will need to push down into the soil and direct the path of this rototiller. It is not, therefore, recommended for hard or rocky soil. They are however more affordable and practical for a small garden. Different Rototiller models operate in a variety of ways. Remember to always read the manufacturer’s instructions before operating any tiller. To break new soil, use a shovel to dig out any large weeds and take out lawn grass. Smaller weeds, on the other hand, can be left for the tiller to dig out. Mark the garden rows for the tiller to follow, to keep rows straight. Read the manufacturer’s instructions on starting the tiller. Note that electric and gas powered tillers work differently. 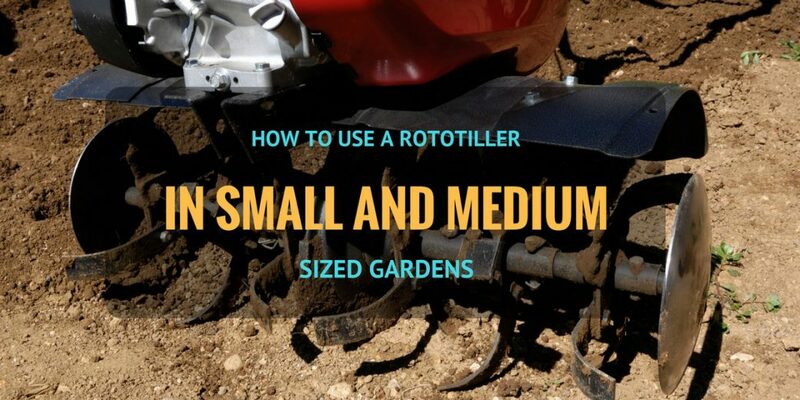 Initiate the rototiller on a low setting at first. Keep a secure hold on the tiller as you dig into the soil and set the depth you want to cultivate. If the blades cannot reach the depth you want, don’t worry asyou can run the rototiller over the garden area as many times as you want. When you reach your desired depth, you may increase power and let the tiller move along the ground at a steady pace. The tiller does most of the work. All you’ll need to do is direct its path. Direct the rototiller first in horizontal lines, then vertically, across the garden to thoroughly cultivate the soil. Rototillers cultivate only on certain soil types. It tends to get stuck in very wet or muddy ground while other tillers will break if applied on hard soil. Consequently, you should use the proper tiller for its recommended type soil type to avoid damage to the machine and injury to yourself. Keep your hands and feet away from the blades of the rototiller at all times. It is possible for the motor of the rototiller to overheat and stop. Hence, take regular breaks, especially on hot days, to avoid overheating and damaging the engine. After use, wipe down the rototiller with a damp cloth to clean. A clean tool stored properly keep sharp and last a long time. I hope you enjoyed this short tutorial as much as it was helpful! As a gardener and landscaper, tools like a rototiller or cultivator saves a lot of energy and time. You can do the labor of five workers, which is why it is a sound investment. A rototiller makes it possible to maintain a large garden by yourself, without much help. It gave me a lot of independence in creating and managing my very own garden, and I hope it does the same for you! Again, if you’d like to see more tips, info and rototiller reviews, you can check our Best Rototiller article andthe Top Mantis Tillers reviews. You won’t regret it! Let me know if you liked my tips and short tutorial in the comments below! Share your experiences owning a rototiller for the benefit of other gardeners!